Ray Gaesser on his farm in Iowa. Uncertainty is growing in America's corn belt -- and Ray Gaesser is worried. 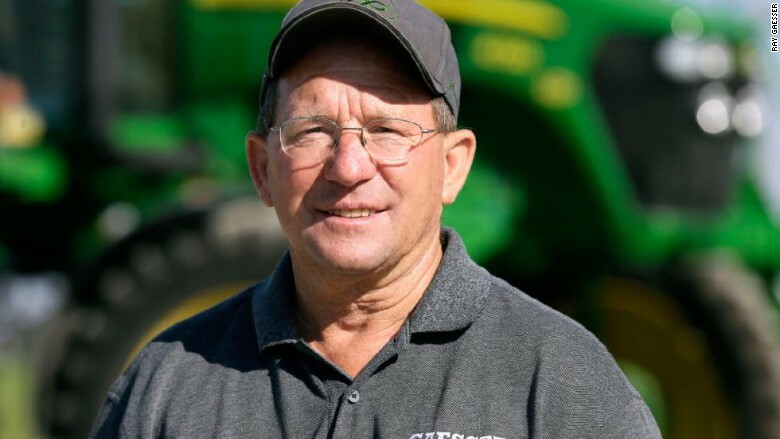 He's been harvesting corn and soybeans on his namesake Iowa farm since 1977. Now, climate change is threatening his business' future. "We're doing the best that we can in an uncertain climate and uncertain conditions," Gaesser, 64, says. "We live and die by the weather." Corn-producing states like Iowa, Illinois, Nebraska and Minnesota have been experiencing extreme weather for decades. Experts like Dr. Eugene Takle, a professor of climate science at Iowa State University, attribute those extremes to climate change. In 2012, farmers struggled to cope with a severe drought that limited production and sent corn prices up. While those dry extremes are decreasing lately, there's a new weather phenomenon making trouble: Rain. "We're getting excessive rains in the spring -- more frequent rains and more heavy rains," explains Takle. What's so bad about rain? Moderate rain can actually increase corn production, but heavy rains can be detrimental. Those rains pull nutrients out of the earth and cause soil destruction, making it more difficult for corn and other crops to thrive, explains Takle. Warmer, moister evenings are also growing more common in the corn belt. That moisture makes it more difficult -- and expensive -- to dry corn before it's sold. Gaesser on his farm in Iowa. "Last fall, it was much more difficult to get the corn to dry in the field," Gaesser says. "We had to put it in our grain storage and run air through it at least for a few weeks." That drying process leads to higher energy costs, Gaesser adds. In theory, there is at least one positive effect of climate change: The corn growing season is now 10 to 14 days longer than it was 40 years ago. That trend technically gives farmers more days to plant -- but heavy rains have made it difficult for them to take advantage. "The number of work days has gone down substantially," explains Takle. Despite fewer work days, corn yields have actually been on the rise. That's because farmers have been investing in better technology to combat unpredictable weather. 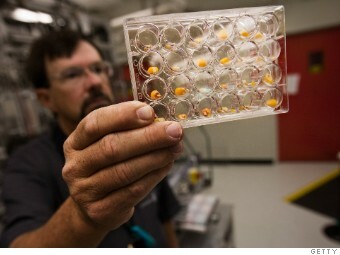 A Monsanto technician engineers corn seeds, 2009. Higher-quality seeds allow corn to "withstand difficult conditions better," explains David Widmar, an agricultural economist at Purdue University. That's thanks to major agricultural technology companies like Monsanto, John Deere and DuPont Pioneer. Monsanto poured more than $1.5 billion into research and development efforts last year to design better quality corn seeds and products. As the Midwest's climate grows hotter, Monsanto notes there's demand for seeds that can thrive in warmer and more extreme environments. "In our breeding efforts and biotech efforts, we're making sure our products can withstand that extreme weather," explains Pam Strifler, Mosanto's sustainability chief. But better seeds mean higher prices. Corn seed prices have been steadily increasing since the mid-1990s, according to data from the University of Illinois. That's resulted in corn prices doubling over the past decade. Technology has helped protect the corn industry from climate change, but Takle and Widmar fear mother nature may one day catch up. If that happens, consumers can expect to feel the impact in several ways. 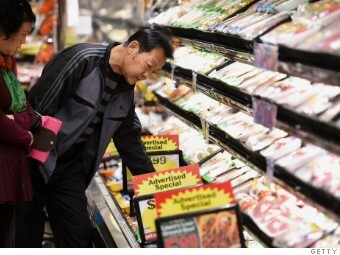 Shoppers in Calif. look for a meat sale, 2016. First, the price of meat, eggs and dairy could change. Around 60% of the corn produced in the corn belt becomes feed for cattle and other livestock. If corn production decreases, prices could rise, making it more costly for farmers to feed their livestock. In turn, the price of meat and animal products could go up, explains Tackle. But don't expect the price of canned sweet corn to change dramatically. There are several costs that go into making corn food products, including packaging, processing, advertising. 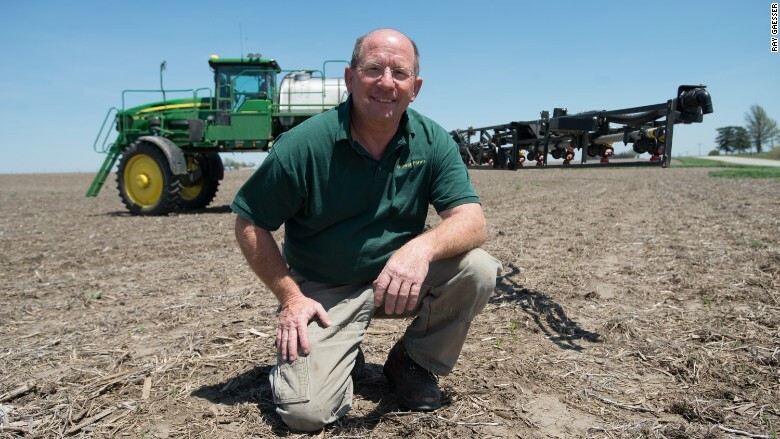 Those costs can overpower fluctuations in corn prices, explains Paul Bertels, a farmer and sustainability leader at the National Corn Growers Association. In addition, "very, very little corn -- 1% -- is used for straight up human consumption," says Takle. Rural economies that depend on singular crops like corn could be directly impacted if corn production changes. "If we see flooding events and drought that's going to impact food production and it's also going to impact the consumers that live in those areas," Widmar says. In addition, climate change could force the corn belt to move north where its cooler. "Corn production in the northern plains has expanded" in recent years, Widmar adds. States like North Dakota and South Dakota are now producing corn, and that trend is expected to continue. The bottom line: Experts can't know for sure what the future holds for America's corn industry. But Gaesser is confident that farmers will adapt to whatever climate changes occur. "We always need to innovate and do the best we can to work with mother nature to feed those 7 billion people that we have today -- or 9 or 10 billion in the future," says Gaesser. "As a farmer, that's all I've every wanted to do." It's Climate Change Week at CNN MoneyStream. For more stories about how global warming is impacting business, follow the Climate Change stream in the CNN MoneyStream app.